Alyssum Purple Royal Carpet Lobularia Maritima is a compact, flowering annual. Other common names of this plant are Sweet Alyssum or Sweet Alison, and this dwarf variety grows only 2-4 inches tall. Alyssum Royal Carpet is easy to grow from seeds and this Alyssum forms a dense, low-spreading ground cover producing mounds of honey-like scented, rich violet-purple flowers that are admired by bees and butterflies. 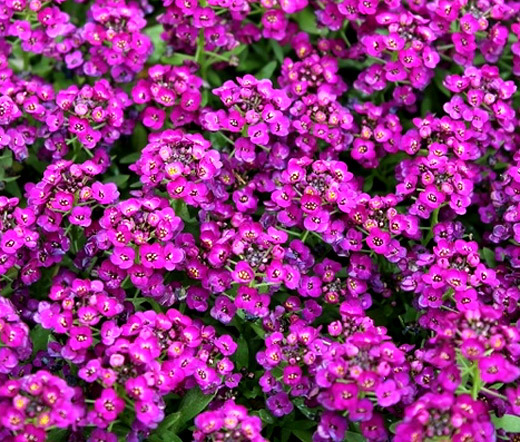 Purple Alyssum has a dense, spreading growth habit and that makes this plant one of the best ground covers. Alyssum is a popular annual for planting paved stones, borders, edgings, rock gardens, containers, pots, hanging baskets, and window boxes. Lobularia Maritima is moderatly drought and heat tolerant.